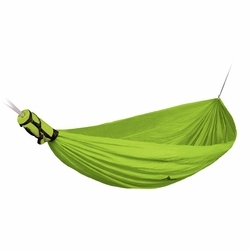 Sea to Summit Pro Hammock. The Pro Hammock reflects the high quality, technical drive behind Sea to Summit. Sea to Summit analyzed the products on the market and sought to improve every aspect: materials, construction, weight, bulk, and ease of use. Constructed from soft, ripstop 70-denier Nylon with high strength plated steel buckles and a Cordura Nylon compression bag. One of the lightest and most compact standard hammocks currently available.